The Amaz!ng Meeting (TAM) is an annual celebration of science, skepticism and critical thinking. People from all over the world come TAM each year to share learning, laughs and the skeptical perspective with their fellow skeptics and a host of distinguished guest speakers and panelists. TAM Las Vegas 2011 had one of the best programs we’ve ever had, with more speakers, panels and workshops than any previous TAM. 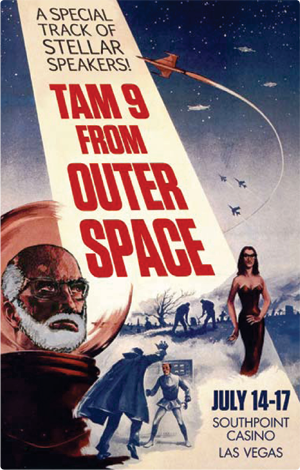 This TAM featured as one of its themes a special space science and skepticism focus, titled “TAM 9 From Outer Space,” including a keynote address from science superstar Neil deGrasse Tyson, director of the Hayden Planetarium and host of the PBS program Nova ScienceNow. Our Master of Ceremonies was the inimitable George Hrab! Enthusiasm for TAM grows every year, and TAM 2011 Las Vegas was the largest TAM yet, with more speakers, more panels, more workshops, and more skeptics than ever before—more than 1,650 people attended! After the sell-out success of last year's event, 2010 was bigger and even more amazing. Line-up included Richard Dawkins, James Randi, Alan Moore, Andy Nyman, Robin Ince, Adam Rutherford, Richard Wiseman, DJ Grothe, Susan Blackmore, Cory Doctorow, Marcus Chown, Melinda Gebbie, Tim Minchin, and very special guest Stephen Fry. The line-up includes James Randi, Simon Singh, the entire cast of The Skeptics’ Guide to the Universe, Brian Dunning from Skeptoid, Krissy Wilson, Eugenie Scott, George Hrab from the Geologic Podcast, Dr Karl, Fred Watson, Rachael Dunlop and a host of other local and overseas skeptics and freethinkers. South Point Hotel and Casino. James Randi, D.J. Grothe, Keynote Event with Richard Dawkins, Carol Tavris, Jennifer Michael Hecht, The Skeptics Guide to the Universe crew, Roy Zimmerman, Phil Plait, Simon Singh, Massimo Pigliucci and many many more for this year. We Voyaged through the Bermuda Triangle to the Turks & Caicos, San Juan, Puerto Rico, and the Virgin Islands of St. Thomas and St. John. Speakers: James Randi and Phil Plait, Adam Savage of Mythbusters, Jon Ronson, Ben Goldacre, and many more. Our first non-US TAM was SOLD OUT. Speakers: Phil Plait, James Randi, Bill Prady of "The Big Bang Theory," Adam Savage, Joe Nickell, Michael Shermer, Skeptics' Guide to the Universe, and many many more. There was also a medical conference, 4 stellar workshops, shows and a vaccination fair. Our fourth adventure on the deep blue seas, took James Randi and the JREF south to sunny Mexico in search of fellowship, fun and a bit of frivolity. With three ports and three days of lectures, we experienced a one-of-a-kind environment where intellect was fed as well as appetite. New speakers this year included Dr. Neil DeGrasse Tyson, PZ Myers, Matthew Chapman, and Sharon Begley. Many of our old friends joined us as well, including Phil Plait (the Bad Astronomer), Penn & Teller, Richard Saunders, Dr. Richard Wiseman, Dr. Michael Shermer, Adam Savage (from the Mythbusters), and Steve Novella. Darwin Was Right! We chartered the Celebrity Cruise Liner Xpedition, and hosted an adventurous 90 passengers on this exclusive and once in a lifetime voyage to the the land where Charles Darwin made his influential discoveries. The Amaz!ng Meeting 5.5: Skepticism and Activism was unlike any other. With speakers Robert Lancaster, Rebecca Watson, Mike Stackpole Mark Roberts and Kelly Jolkowski, a new format, and more audience interaction, this was a unique opportunity to experience a more intimate gathering with your fellow skeptics. Trey and Matt from Southpark, Adam and Tory from Mythbusters, shows by Julia Sweeney, Jill Sobule, Banachek, Jamy Ian Swiss and Hal Bidlack, as well as Peter Sagal, Scott Dikkers, John Rennie, and many others. Anderson Cooper talking on Sylvia Browne with Randi was a highlight. James Randi and guests survived a Caribbean cruise through the Bermuda Triangle, and beyond. Despite problems with weather, and one of our team being injured mid-journey, the Amaz!ng Adventure was a great success, featuring lectures by Michael Shermer, Banachek and Hal Bidlack and many oceanside chats with Randi. The Amazing Meeting 4 had nearly 800 attendees. The Mythbusters, Murray Gell-Mann and Nadine Strossen, Ellen Johnson were among the guest speakers while Todd Robbins and Mack King supplied magical entertainment. Many of our past guests returned as well. The Amaz!ng Meeting 3 had nearly 600 attendees. Dr. Richard Dawkins, Christopher Hitchens, Dr. Richard Wiseman, Dr. Joe Nickell and Dr. Michael Shermer were among the many distinguished guest speakers. The Amaz!ng Meeting 2 had nearly 250 attendees. This was Penn & Teller's first appearance with us. Highlights included magic by Banachek, Lance Burton and Jamy Ian Swiss, Julia Sweeney's rough draft of "Letting Go of God," mentalist Ian Rowland and scientist Eugenie Scott. The Amaz!ng Meeting was suggested by forum members, and when our numbers reached an unexpected 150, we knew there would be more than one Amaz!ng Meeting. Guests included Hal Bidlack, Jack Horkheimer, Jose Alvarez, Phil Plait and Robert Todd Carroll among others.